If you have ever encountered a striking feather flag, there is more to it than first meets the eye. Choosing the right feather flag accessories is incredibly important in order to display your feather flag successfully. Ground stakes or spikes add an extra security to a feather flag by anchoring it to the ground. Because the stake must be inserted into the ground, it is most suitable for outdoor environments. It is recommended that you use the ground stake in the grass or compacted dirt for best results. The X-Base is a simple metal base that is sturdy and lightweight in construction. The x-base is configured in an “x” shape, hence the name. The Water Weight X-Base Cover is an inflatable donut-like tube that can be placed on top of the x-base in order to secure it better. Because the water weight bag is emptied, it is excellent for travel.If you need flexibility and portability, a water weight bag is recommended. The water weight bag is filled with water and set atop the x-base in order to secure it better in an outdoor environment. The water weight bag can be emptied of water and easily packed away for storage. The combination of base and bag make an excellent combo for any environment! This base is made of a heavy-duty material that can be filled with water. It is much heavier than the x-base making it suitable for outdoor conditions. This is the most stable platform for any feather flag. You may have the best-looking flag around, complete with the accessories you need to keep it flying, but how are you going to carry it? Feather flags can be cumbersome to carry, not mention more than an armload. FLS Banners sells quality carry bags that can fit the feather flag material, poles, and more in one convenient enclosure. Carry bags cut down on setup time at an event and pack up when it’s time to go home. With a carry bag, you won’t have to take more than one trip from your vehicle and you won’t run the risk of losing important hardware. When deciding what the best feather flag accessories to buy, it might help to consider what type of environment your flag will be in. Since feather flags are appropriate for both outdoor and indoor use, choosing the right stand for indoor or outdoor use depends on where the flag will be used. In indoor situations, such as a tradeshow or a mall, the x-base makes an excellent choice. The x-base is lightweight, making the feather flag easy to move. A simple and efficient solution to feather flag security is the ground stake. The ground stake can act as an anchor, best used in an outdoor environment. Tying your feather flag to the ground stake, and inserting it into grass or packed dirt adds extra security. In the case that you will be using your feather flag both indoors and outdoors, the water weight bag is recommended to be used together. The water weight bag can be fitted over the top of the x-base for use outside or can be stored away for indoor use. Having both gives you more options in where you want to place your flag. The water base is the heaviest and most substantial of the group. Because of its weight, the water base cannot be moved as easily as the x-base without being emptied of water. However, it is much more sturdy than the x-base and better suited for outdoor conditions. If you are planning to keep your feather flag outdoors for extended periods of time or are keeping it outside in windy conditions, the water base is your best bet to keep it from blowing over. This much variety ensures that you have multiple shapes to choose from to best fit the theme of your brand. Feather flags differ from traditional square flags in that they are stretched across a pole frame. This means that they will be fully visible, at all times. Traditional square will hang limp when there is no wind or they are indoors. Square bottom flags have the distinctive curve of a feather flag to one side while having a straight edge down the other. The bottom of the flag is squared off completing its distinctive shape. Teardrop flags are so named because of slope at a much more acute angle. The shape they make is reminiscent of a teardrop, hence the name. Since the lack the square bottom of other types, there is less surface area near the bottom, but they have a much more distinctive appearance and modern appeal. Concave bottom flags are similar to square bottom, however, the bottom is more pronounced as the border slopes slightly upward. This shape shares qualities from both the square bottom and the teardrop styles. Convex bottom flags are shaped the opposite from concave, as the bottom rounds outward, rather than inward. Convex style has the most rounded appearance of the different flag shapes. Swooper flags have obtuse angles at both the top and bottom corners. When it comes down to making a decision, the shape of your feather flag truly depends on your taste and how its shape will convey the message of your brand. How will your logo be placed in the design? Will you have additional text running down the flag? Do you have additional decorative designs you would like to add to it? Are you looking for a more modern or traditional appeal? These factors can be considered when choosing a feather flag shape, as using the surface area of the flag is important in the initial design. Choosing the right feather flag size doesn’t have to be complicated. FLS Banners makes it simple to pick a size. FLS Banners offers three sizes, small, medium, and large. Each size was carefully planned in order to meet the needs of buyers. Which flag size is right for you? Deciding which size of feather flags you need is a matter of environment. Will you be indoors or outdoors? Where will you be displaying your flag? In a hallway, sidewalk, or other location? Smaller feather flags may better suit indoor environments where space is more restrictive. Larger flags might do better outdoors where they will be more visible to ongoing foot or vehicle traffic. Choose from 8ft small, 12ft medium or 16ft large feather flags. 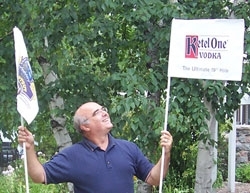 Visibility is an important factor in displaying a flag outdoors. Roadside flags need to be able to catch the eye of oncoming motorists. Outside your place of business next to a road or sidewalk, events like carnivals or fairs, or even outdoor community events, are great places to show off feather flags. Large flags can help make your booth or tent stand out in a crowd. Depending on your outdoor location, you will need to decide on a small 8ft, medium 10ft or large 13ft feather flag. Moreover, depending on the ground you intend to place it on, choosing the appropriate bases and hardware will be helpful. Our feather flag kits are a great place to start if you would like to purchase a flag and base together for your outdoor feather flag. An indoor display is a different matter. Flags are great advertising tools for trade shows and indoor malls. More than likely, space will be limited indoors, making small or medium flags the perfect candidate for indoor display. They will be great for attracting attention and improving brand image but will fit indoors and not get in the way. Be sure to measure the height of your ceilings if they are low and also leave plenty of room for foot traffic to move around the feather flags. An x-base is ideal for an indoor use, add a water bag for more stability. Learn more and understand which base is best for my feather flag. Full-size golf pin flags (14" X 20") now come in two styles, the traditional with header and three brass grommets or the tube insert style. The tube insert style simply slips over the top of the pin, the ties and flag swivel are not needed. The flag is held on just with the acorn nut on top of the pin. A swivel may be needed with traditional style if not available from your greenskeeper. Stand-Out™ Golf Flag has an arm in the top that allows the flag to swivel and flap in the breeze, but the image is always visible. No wind; no problem! The traditional style has been used forever and golf courses generally have the hardware to tie the flags onto the pins. This style is best if you want to frame the flags after the event or use them for autographs if yours is a celebrity event.